When the mobile phone was first launched about two decades ago, not many envisioned that such a bulky and expensive device would go on to become one of the world’s most indispensable modes of communication. But despite its omnipresence many people are still ignorant how it functions. Energy travels in the form of waves known as electromagnetic waves. These waves differ from each other in terms of frequencies. This whole range of frequencies is called the spectrum. In telecommunication like TV, radio and GPRS, radio waves of different wavelengths are used. They are divided into bands based on frequencies (see ‘Radio spectrum’). Mobile phones use two technologies based on different parts of the radio spectrum— GSM (global system for mobile communications) and CDMA (code division multiple access). 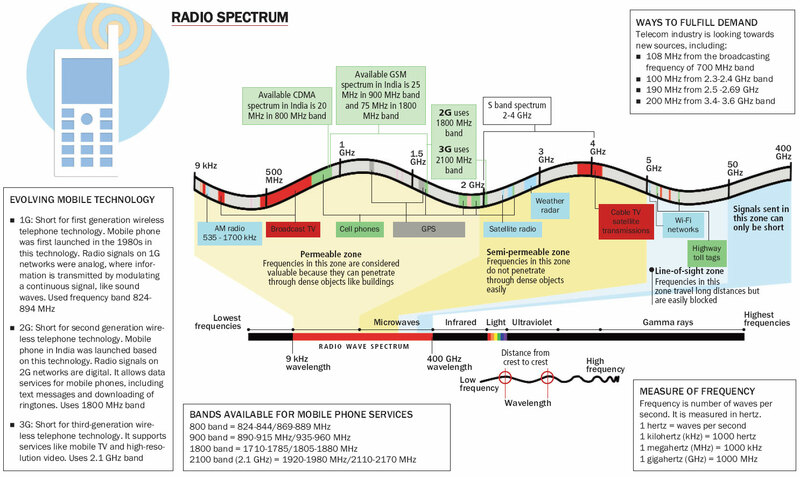 Most of the radio spectrum is reserved in countries for defence. The rest is available for public use. But following an increase in the number of phone users and new services, countries started auctioning the frequencies to telecom companies. This sale has become a major revenue earner for governments around the world. But in India, the case is different (see ‘How India lost to scams’). It is currently auctioning the spectrum in the range of 1959-1979 MHz. This, however, is not sufficient to meet the growing appetite for mobile phones and its services. 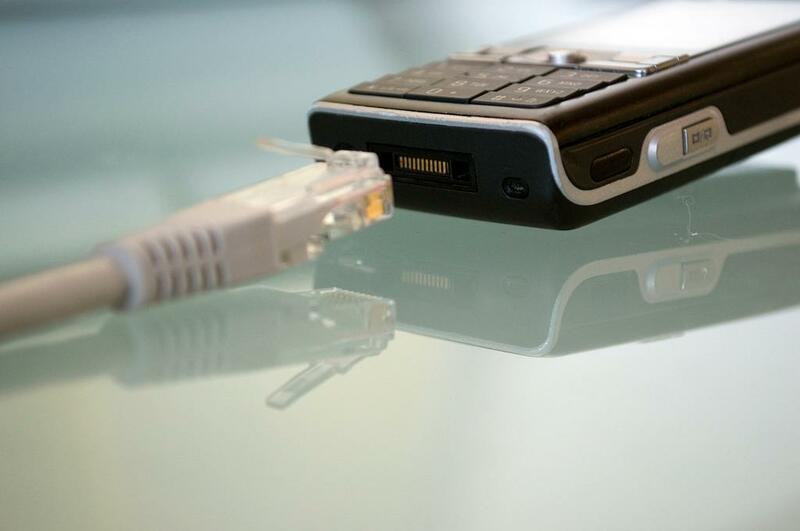 Telecom industries are now looking towards new options. S band spectrum, for instance. The frequency of radio waves in this band ranges from two to four GHz. S band was allocated by the World Radiocommunication Conference, organised by International Telecommunication Union (ITU), in 2000 for terrestrial mobile communications services. ITU is a UN body that regulates information and communication technology issues. S band was initially used by meteorology departments and communications satellites. Mobile phones entered India based on 2G technology (see ‘Evolving mobile technology’). 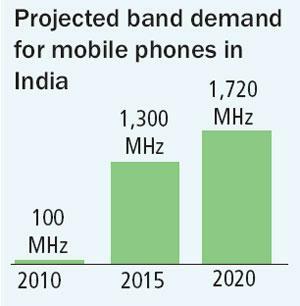 Sixteen years later, demand for advanced technologies prompted the government to auction 2.1 GHz band for 3G services. Recently, four former Indian Space Research Organisation (ISRO) scientists, including a past chairperson, were blacklisted for their role in the controversial Antrix- Devas deal. They had sold part of the S-band spectrum at a low price to Devas Multimedia Private Ltd without informing the Space Commission. 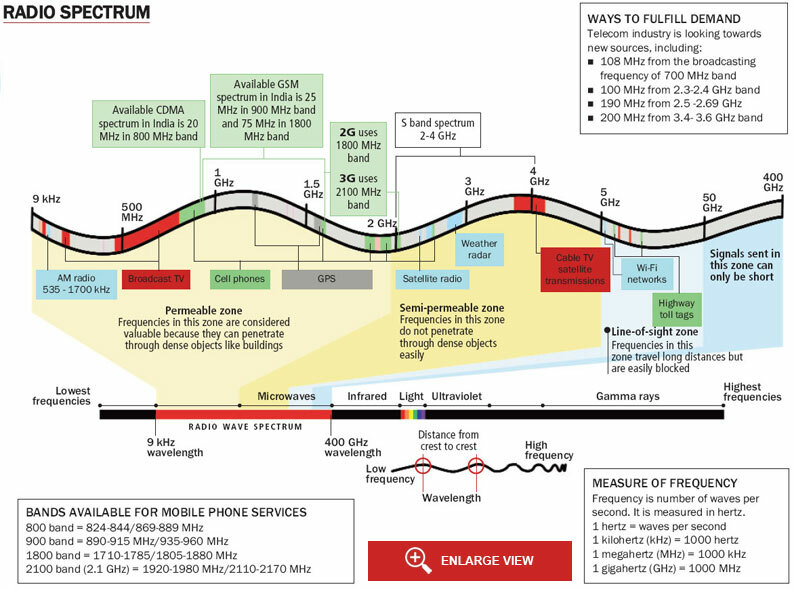 This spectrum was given to ISRO by Wireless Planning Commission (WPC) under the Department of Telecommunications for mobile satellite services (MSS). It was to be utilised for satellite phones. But even years after it was given to ISRO, the band has remained unutilised. Mobile operators have been lobbying for part of this S-band (2.5 – 2.69 GHz) as an extension for 3G services. They say S-band is a limited natural resource available to the country and it should not be wasted. ISRO has been unrelenting. “What we’re saying is that allocate more S-band spectrum for terrestrial mobile services. The spectrum allocated for MSS is currently unutilised,” says Rajan Mathews, director general of Cellular Operators Association of India. Its use will strengthen information infrastructure and 3G services, he adds. G L Jogi, assistant director general with Telecom Engineering Centre, an organisation that frames specifications for telecom instruments in New Delhi, explains, “2.1 GHz is the preferred band for 3G operations worldwide and operators have rolled out 3G networks in this band. However, the band is limited.” He adds that in India the band is in short supply because there are many users and service providers. Operators thus get less spectrum and this affects the quality of service. “So, additional bands are required and 2.5 GHz forms an attractive preposition,” he says. According to the Telecom Regulatory Authority of India (TRAI), India had 670.6 million mobile subscribers in 2010. India is expected to have around 400 million 3G connections by the end of 2015, as per Wireless Intelligence, a global database for mobile market. This will be 30 per cent of total mobile connections in the country. Experts also argue that promoting satellite phones is unwise. Instead, S-band can be used for 4G. S-band is part of the microwave band of the electromagnetic spectrum. Frequency of the band ranges from 2 to 4 GHz. It finds use in satellite communication, weather radars and defence. In 1980, India began using S-band for Broadcast Satellite Services for television. International Telecommunication Union later allocated it for use in mobile satellite services. The 2.5 GHz band is also being used for developing 4G technology. ISRO holds 150 MHz of the band. Sudhir Gupta, principal advisor (mobile services) in TRAI, informs that they have already recommended to the government that a part of S-band be allocated for commercial services like high-speed packet access used in 3G. “These services need a lot of spectrum and the current spectrum is not sufficient,” he adds. ISRO did not respond to the repeated queries by Down To Earth. The announcement of the spectrum allocation policy by the department of telecommunications (DoT) has spurred a letter writing campaign. Giant cellular service providers like Tata Indicom and Cellular Operator Association of India (COAI) have shot off angry letters to the prime minister, petulant about the policy favouring their competitors. The ensuing squabble between Code Division Multiple Access (CDMA) and the Global System for Mobile Communication (GSM) operators has brought into focus the importance of limited resource of spectrum—calls and data transmitted over airwaves. And the service providers are ready to fight tooth and nail over the bandwidth being vacated by the defence ministry. The new DoT policy, which came into effect on March 31, has allocated a maximum of 15 mhz to gsm operators, such as Airtel and Hutch, and 7.5 mhz to CDMA players, such as Reliance Infocomm and Tata Teleservices. Earlier, the maximum limits were 8 mhz for GSM and 5 mhz for CDMA. Official estimates say Delhi will require an additional 28 mhz to sustain current telecom growth. Though the policy recommends a 2:1 ratio allocation to GSM and CDMA operators, it withdrew the existing condition that CDMA operators were to add more users than GSM operators if they wanted extra spectrum. The new policy mandates equal subscriber base for more bandwidth. Ratan Tata, the chairman of Tata group, in his letter to the prime minister has brought up the issue of 'self-proclaimed subscriber base'. He is opposed to the policy of distributing spectrum on a subscriber-number basis without a proper verification mechanism. At present, Bharti Enterprises leads the GSM group with 18.5 million subscribers and Reliance heads the CDMA group with 14.6 million users. The policy has angered CDMA operators on other counts as well. DoT has ordered 2:1 ratio spectrum distribution on the premise that CDMA technology is more spectrum-efficient. But the operators claim that they are receiving the short end of the stick because of better technology. According to CDMA lobbyists, this is against fair trade practices and the government's commitment to technology-neutral services. Each group interprets 'fair play' differently. While the CDMA group wants equitable distribution, the GSM lobby claims a 5:1 ratio would be fairer as the spectral characteristic of CDMA technology affords it five times more capacity. 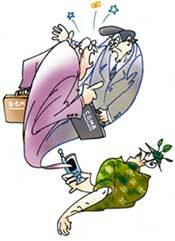 In view of the arguments, CDMA operators' plea of unfairness in allocation is tenuous. Their demand for more bandwidth in spite of owning more efficient technology is contradictory in itself. The availability of spectrum to each operator will decide the company's future growth and ability to hold back competition from other players. Spectrum availability has been a global problem with disputes over spectrum occupation. Defence establishments were often granted bulk spectrum in the absence of commercial demand. Now, with escalating commercial demand for more frequencies, the war over spectrum allocation is inevitable. In view of the increasing pressure for more space from the telecom operators, the prime miister constituted a high-powered group of ministers (GoM), headed by defence minister, Pranab Mukherjee, to draft a new policy and vacate spectrum space alloted to the ministry of defence. However, DoT drafted its own policy in the absence of GoM's recommendations. With the formation of the GoM, both CDMA and GSM groups lobbied fiercely for a bigger chunk of 45 mhz of spectrum being vacated by the ministry of defence. With every move to free more bands for the telecom sector, such battles will become more frequent. 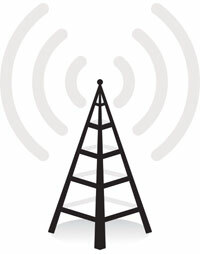 The Centre recently announced that it would spend Rs 1,000 crore in opening up more bandwidth for the telecom industry. More state-owned spectrum facilities will be vacated soon. 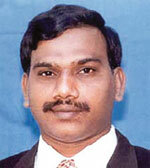 The industry accuses the defence sector of wastefully underutilising the large number of frequencies allotted to it. The defence ministry claims that most of the equipment in use was procured overseas and vacating frequencies will mean added costs. They have demanded payment from the government or the industry for the re-tuning of equipment. Sources in the industry say the Tatas are willing to pay but not Reliance. The Indian cellelur telephony sector has recorded a qrowth of 20-25 per cent and 100 million subscribers. With such an enormous growth, the controversy over spectrum allocation needs to be addressed sooner than later as the global telecom industry moves to the next generation of technology—3G—of which, visual wireless telephony comes as a starter. You wrote quite a lot except about the effects of these mobiles on environmental health. There are strong reasons to hold this mobile technology responsible for disappearance of birds, insects and bees. An impartial and non-governmental research is required to look into this although no country of the world, especially India shall be ready to impose any regulations on the use of mobiles. These mobiles are certainly an environmental hazard, 'to what degree' is a matter of study. 1. TV transmitters operate in a similar freq. range (300-800Mhz). Their output power is maybe 100 times that of a cell phone tower. Have you heard about people or animals living near TV tranmission stations falling ill? 3. Military installations, police, airport installations, aircrafts etc have been using radio communications for decades. How have they not been affected?